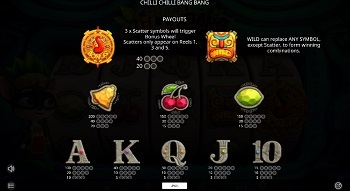 Chilli Chilli Bang Bang is an iSoftbet-powered fruit machine with a twist. It combines traditional slot symbols such as cherries, lemons and bells with ancient Mayan culture items like totems and masks while the reels look like carved in stone. The protagonist of the slot is Chillihuahua, a Chihuahua that flying on a leaf on the right-hand side of the reels, performs some magic and celebrates your wins. The reels are set in front of an ancient Mayan temple which contributes to the theme of the game along with a matching soundtrack. The game is brought to you by iSoftBet, a developer of online and mobile casino games that has been certified in Italy, Spain, Belgium, Portugal, Alderney and the UK. Their portfolio includes a wide range of video slots including branded titles based on popular TV series and movies. The London-based company earned its reputation by developing high-quality gaming content with slot games that look great and keep players engaged thanks to multiple bonus features such as free spins, bonus rounds, multipliers and more. 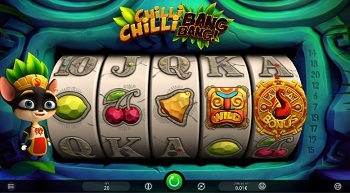 Chilli Chilli Bang Bang uses 5 reels and 20 paylines. All you have to do before you set the reels in motion is to adjust the stake to your bankroll by choosing a bet per line from a range between $0.01 and $1. That means that your total wager can be from $0.20 to $20, which is not suitable for high-rollers but if you are one, you should not give up on it easily. The Autoplay feature can come in handy in case you don’t feel like spinning the reels manually. The slot machine’s appearance is stunning with impressive 3D graphics and spectacular animations, especially when you are close to triggering the bonus game or upon hitting a big win. The previously mentioned traditional slot symbols make up the higher ends of the paytable while playing card symbols pay lower prizes. We find including playing card symbols in the paytable uninventive, but iSoftBet has designed them to match the stone-carved reels and other symbols. Wild depicted as the mask appears on the reels to substitute for all other symbols and help you create more winning combinations. The only symbol that cannot be replaced is Bonus Scatter landing on the reels 1, 3 and 5 only. 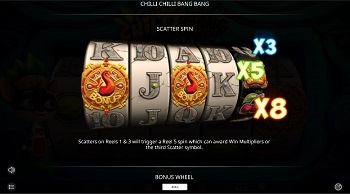 If you land Scatters on the reels 1 and 3, you will get a Scatter Spin that will affects the reel 5 which can award up to 10x multiplier or the third Scatter symbol you need to unlock the Bonus Wheel feature. Once triggered, the Bonus Wheel can award one of three free spins features – Growing Multiplier, Stacked Wilds or Wandering Wild Free Spins. The first feature awards multipliers increasing up to 10x, the second one adds stacked Wilds to the reels 2, 3 and 4 while the third option adds Wandering Wild which moves across the reels and leaves a sticky trail of substitutes. At any point of the game, Chillihuahua can perform some magic and trigger one of the extras at random. That means that during the base game, you can benefit from Stacked Wilds or Wandering Wild that will boost your winning chances and help you win bigger prizes. The top paying symbol is the bell awarding 200 coins for a five of a kind combination. While playing the game you can win up to 40,000 coins thanks to a 10x multiplier that can be awarded within the base or bonus game. Landing 3 Scatters on the reels 1, 3 and 5 pays 40x your bet. 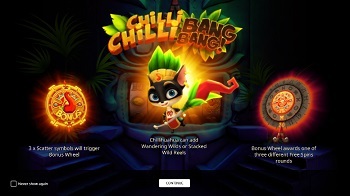 Chilli Chilli Bang Bang is a low to medium volatility game with an RTP of 96.12%. If you like ancient civilisations including Mayan, you will love this innovative offering from the iSoftBet creative kitchen for both its aesthetics and functionality. Frankly speaking, its payouts won’t knock you off your feet, but if you are a novice to this form of entertainment and look for a slot machine that will provide you with the balanced gameplay, look no further. 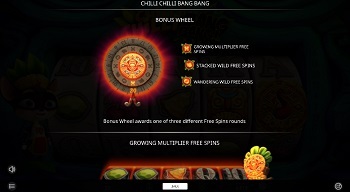 Meet Chillihuahua and let him add some magic to the reels because it can result in a decent increase in your bankroll.